Volvo may not be the most exciting noun in the world. In fact for many, the poor old Volvo brand is synonymous with a kind of reliability that is embarrassingly dull. But Volvo doesn’t just make trucks and cars for maths teachers. Volvo is at the forefront of the one of the most exciting sports events on the planet. 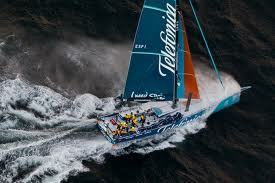 Have you heard of the Volvo Ocean race? Despite its apparent one billion+ audience, not many people seem to be familiar with it. For those who are currently muttering, “the Volvo what?”, it’s the toughest yacht race around. One competitor has described it as the boating version of Mount Everest and rates a win higher than an Olympic gold. Battling waves as big as 15 meters high in the world’s most unexplored landscape, the Volvo race covers a staggering 39,000 miles of saline, passing through a total of four different oceans in the process.In an epic battle between man and nature, the epic Volvo race makes a rugby match look like a game of twister.At the time of writing this feature, the race is in its eighteenth day and is in leg 4 (Auckland). Leg 5 will take the yachts and their brave crews all the way to Itajaí in a Brazil. That gives you an idea of the magnitude of the race. Volvo isn’t so boring now is it? And neither are the people who sail Volvo Open 70 class yachts. Note: the Open 70 is not a specific brand of yacht but a list of requirements laid out by Volvo for the vehicles which take part in the Ocean Race. If you’re into your nitty-gritty then the specifications are: a Canting keel which is capable of canting transversely up to an angle of 40 degrees and a body which is constructed from either glass fibres, aramid fibres, or carbon fibres. The V70 class which replaced the V60 class has proven itself to be the fastest monohull sailboat class ever built. Since the class came into being it has smashed speed records as yachts traveled incredible distances in unbelievable times. The V70 class is a masterpiece of engineering and design and will shine in the 2011-12 Volvo Ocean Race and no doubt in the 2014-2015 event and beyond.